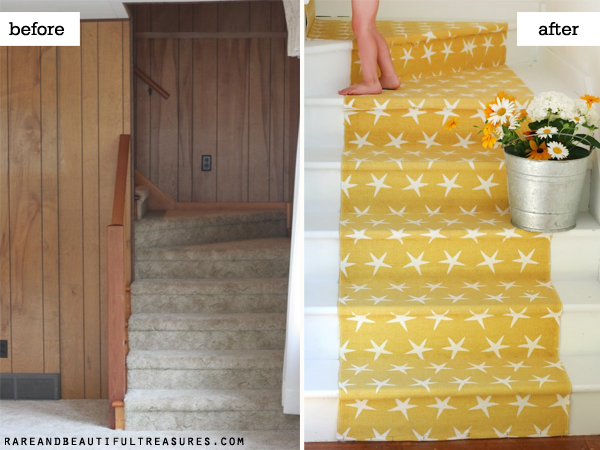 I am so excited to finally be able to share the before and after of our front staircase in the beach cottage! A lot of work went into this project and we are so happy with how everything turned out. I will give it to you straight-this was a lot of work 😉 Details below! We had professional flooring guys pull the carpet off the stairs when they were here pulling the carpet from the living room. We could have done this step ourselves but it was just easier to go ahead and let the professionals pull it out while they were here! We removed the carpet tack strips and about one million carpet staples using pliers. This step took a long time and a lot of elbow grease and blisters. I recommend using pliers specifically made for removing carpet staples from the floor. I applied 3 or 4 coats of white Kilz primer and 1 coat of pure white porch and floor paint to the wood. I purchased an antique finial to add additional architectural interest. On another DIY note, I have moved the blog from Blogger to WordPress. It is a change I have wanted to make for some time because of the additional design freedom that WordPress offers. Unfortunately, if you were following the original blog via Blogger Friend Connect or RSS feed or by email, you may not be getting updates any longer when new feed posts. If this is the case, please feel free to update your feed subscription by clicking the RSS button on the side panel or by re-entering your email address in the “subscribe by email” square on the side panel. Thanks, friends! Thinking about starting a blog of your own? Looking to improve the blog you already have? Don’t know a widget from a plug-in? Don’t know RSS from SEO? 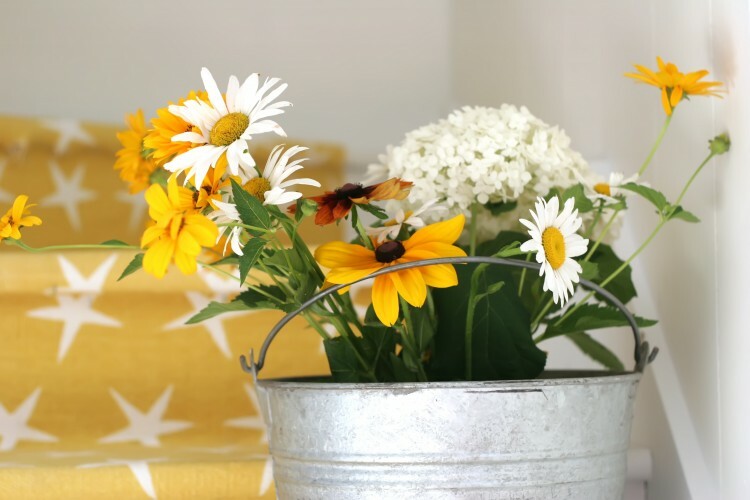 Join me in the Jones Design Company’s The Blog Class! Erin, that was worth every ounce of blood sweat and tears!!! Stunning is an understatement and that yellow pattern on the white is just lovely. As always, your vision is perfect and the outcome is magazine worthy. Can’t wait to see more of the beach cottage! I’ve switched to wordpress, too, but I haven’t figured it all out yet, so I am still over at blogger. LOVE the staircase..it looks so good!!!! Great job!!! I LOVE it! I have not seen the star runner in yellow. I would have done it in the 4 runners to get that super cute print! Job well done. Looks beautiful. Can’t wait for more pictures to come. How beautiful! I wish I would have had you use your creative talents on our stairs while you were staying in Wilkesboro. Its fabulous!!!! I love the white walls and white floor. The runner is just too great! Lovely staircase Erin. 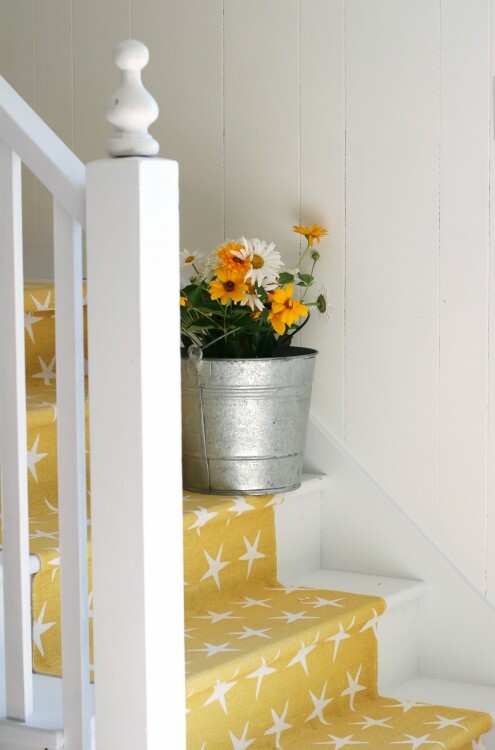 I love the white paint and yellow star runner – so bright and cheery. gorgeous! what a great eye for design you have. love those skinny little legs popping in the photo, too. You guys did a fantastic job! The stairs to my basement has nasty blue carpet on it, and I’ve been wanting to pull it up. After seeing your pictures, I am definitely ready to make the move!! Oh. My. STARS!!!!!!!!!!! That is fantastic!!!! It’s fantastic! I’m pinning this because it’s giving me the go ahead to rip out our nasty carpet and give my stairs a cute treatment. Thank you! PS: Those chubby little legs and feet are the sweetest! Looks absolutely awesome, Erin!! Love it! 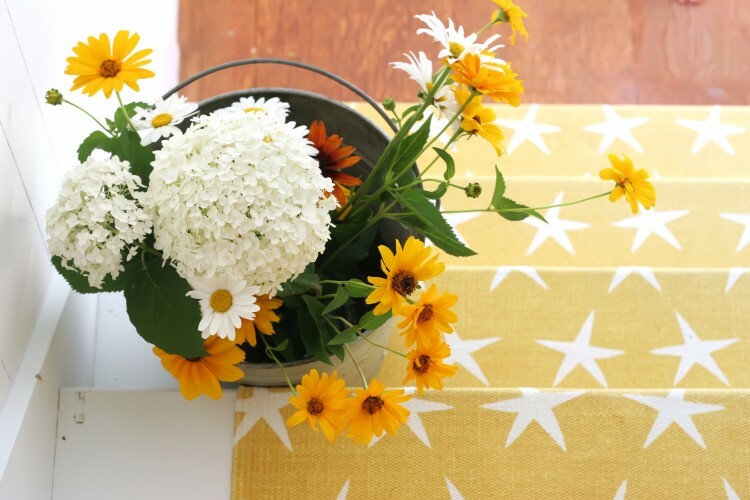 LOVE the yellow and stars! What a refreshing look! Nicely done. Found you from The Lettered Cottage. I’ll definitely be back to look around your blog some more! Hi, Erin, it’s been so good to catch up on your beach cottage journey (clicked over from Layla’s). Loved your stairs and what you’ve done so far. I had to go back and see what you’ve been up to. Last time I caught up with you, you were in the rental house and I saw the kitchen you made pretty. I’ve gone through my own personal journey this past year and 1/2, finding my way back to a home again and God is leading the way too. It was so heart-warming to read your precious words and how you share your story. Love your voice! The Lord has taught me so much this past couple of years with so many trials he brought me through (I so get how God can move) and I’m now renovating a 1979 fixer upper too. It was really ugly, but I saw so much potential and it is coming alive now and I can’t wait to get in there. God made it happen and I’m so grateful to get to live there. Not even close to a dream home, but it is MY dream home. Thanks for sharing your heart, you have touched mine tonight! Looks great, love the colors and the star pattern on the stairs. We have a cottage and would love to have one of the rugs in my kitchen. Do you know if they are still available? BTW, your stair redo is gorgeous! Checked with Garnet Hill and that particular style is no longer available. I so love that design! Oh well, the search will continue. Thanks so much for sharing such a beautiful redo! That has to be the happiest staircase I’ve ever seen – so light and bright and full of sunshine. Love it! Quick question: what is the texture of the carpet? The pictures look almost like a burlap weave, but I wouldn’t think that would be thick or soft enough underfoot. Thank you! The runner is cotton! Here from the Lettered Cottage, LOVE the job you did here. Great choice with the runner. This is so pretty. I pulled the carpet from my stars last labor day and went with white and wood stain, but I am loving this, I may have to change ours. If you have a moment, will you tell if you applied poly on top, just curious. Thanks for sharing. Hey Tiffany! No poly, just the primer and the paint! so glad TLC featured you today because I just thought you hadn’t posted anything since June. I will update my feed. The stairs look GREAT! e- it looks amazing! great job. i am so impressed you manage all this work with being a mother to a toddler and baby on the way! you are such a little rockstar! love the new blog too! 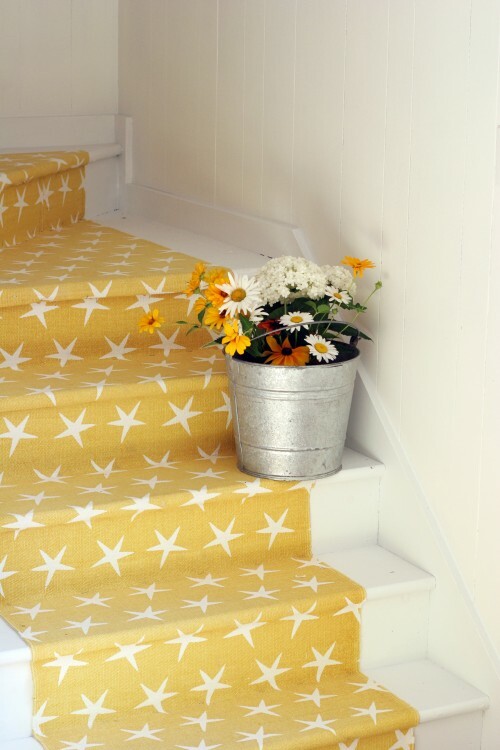 I love this…I painted my bedroom white this year and was wondering what specific paint you used for the stairs? I love my bedroom, but the paint I used has a gritty feel which makes it hard to clean. So pretty! Love the star print – so unique and beachy. Even though it was a challenge, it was so worth it! And thanks for sharing about The Blog Class! Wish I had some stairs just so I could try it! It’s lovely! And what a difference from the before pics! I love, love, love your star-studded stairway!! And maybe just maybe it isn’t perfect. But, remember, The Nester says, “It doesn’t have to be perfect to be beautiful.” And my oh my…it IS beautiful!! As I was reading your blod I realized that it has been some time. I’m glad that I can now re-subscribe and catch up on all the beautiful goodness that God is doing in your lives. I forgot to mention that I popped by from The Lettered Cottage. Now this is a transformation. I love it!!! Your stairs look amazing! I just finished mine recently and I KNOW the work required to pull this off. Beautiful job! I love this! Such a bright and “happy” color. Love the stars too, how fun! 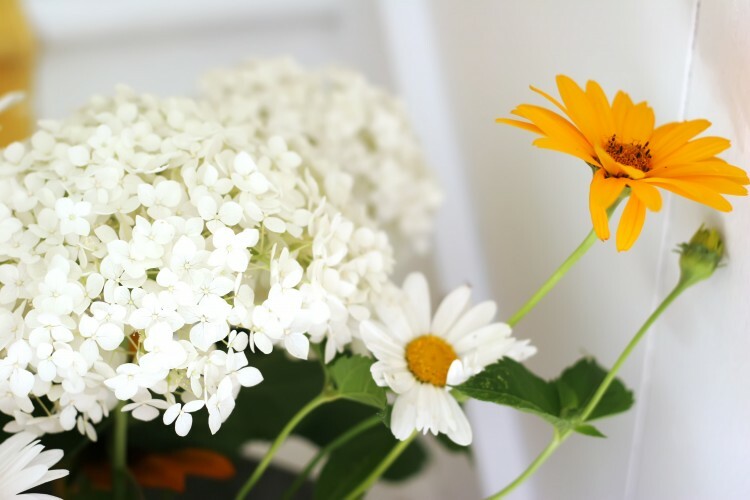 I love your blog and am adding you to my Reader! This is so inspiring! I think I have to rethink my plans to replace the worn carpet on my stairs and copy your idea. What a fantastic result! We had the same paneling and the same staircase, turns and all. We redid the walls and ceilings, but never figured out what to do with the stairs. This is so beautiful. Thank you for the inspiration. Love the stairs! I have been afraid to tackle mine since I don’t know what’s underneath. 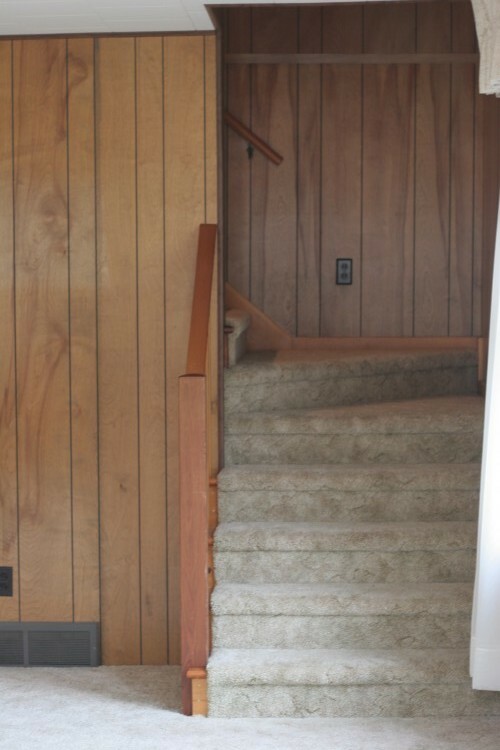 Are all stairs able to be painted and used uncarpeted or do they have to have been “finished” at some point? Thanks, Connie! We knew our stairs would be ok uncovered because they are hardwood. If your stairs are wood, they should be fine. If you have a newer house and the stairs are plywood, you probably wouldn’t want them exposed. Oooh! I just love how the staircase turned out! 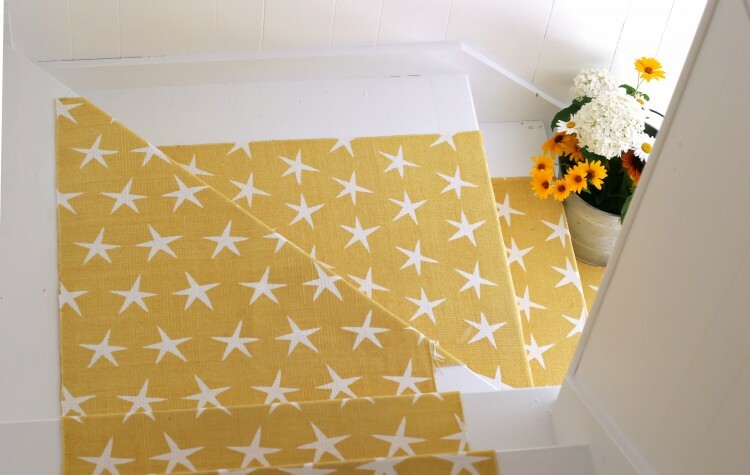 That yellow-star runner is just so perfect and so beachy! It adds such a cheery feel-awesome job! 🙂 I always enjoy your DIY projects, I can’t wait to see more as they unfold! I see the note now about Blogger to WordPress…this explains why I haven’t been getting your updates. I’m off to see if I can correct it in my sidebar reader…. Ended up here from TLC and am enjoying catching up on your blog! 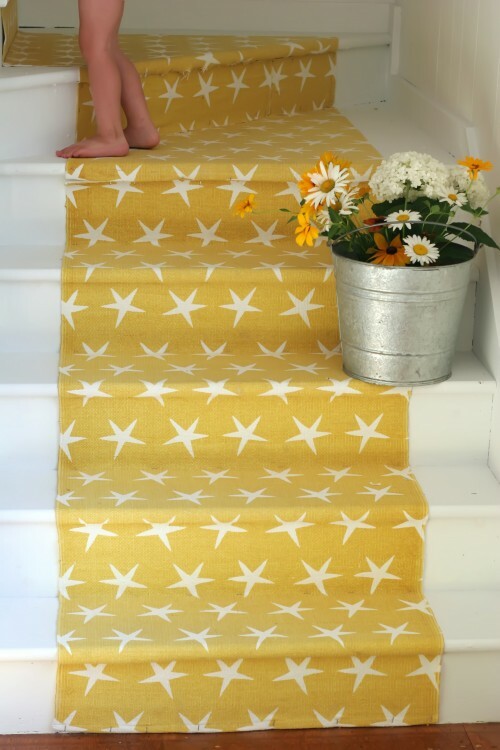 I have a similar stair situation at my beach cottage and have been planning on a runner, but I am still struggling with how dirty and hard to care for the white steps are. Do yours stay clean?- the parts outside of the runner that is. Did you use any special paint? I LOVE this! Well done. Thank you for sharing!!! 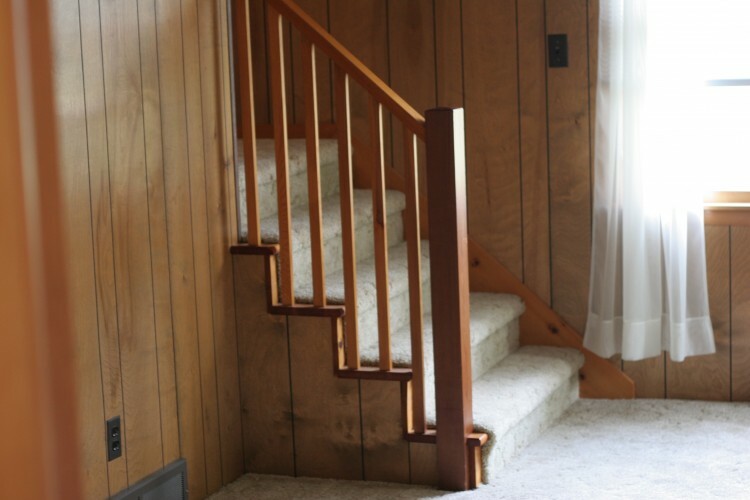 This isn’t necessarily related to the stair makeover, but as I was looking at your post, I noticed you had painted over the wood paneling. I am interested in what you used. Since it has been a little while since your post, has what you used lasted? Thanks for sharing!